With Christmas just around the corner, many of us are bracing ourselves for six weeks of feasting festivities, resulting in the average person piling on 4lbs! Don’t stock up – It is often tempting to pack the cupboards full of unhealthy treats, knowing you will have many Christmas visitors to entertain. However, it is harder to resist temptation when it’s staring you in the face and you will most likely find yourself polishing off snacks to stop them going to waste. Eliminate this issue (and save some cash) by not having the goodies in the house. Enjoy the winter air – Use visits from family or friends as an excuse to wrap up and go for a lovely winter walk. It’s a great way to spend time together, explore the local area and burn off those festive snacks. Count your canapés – With canapés and nibbles being passed around it’s easy to lose track of how many pigs in blankets you are consuming. Make an effort to be conscious of what you are eating to avoid consuming too many calories. Never arrive hungry – Turning up to festive parties hungry means when the food is bought out your animal instincts will take over and you will gorge and overeat. 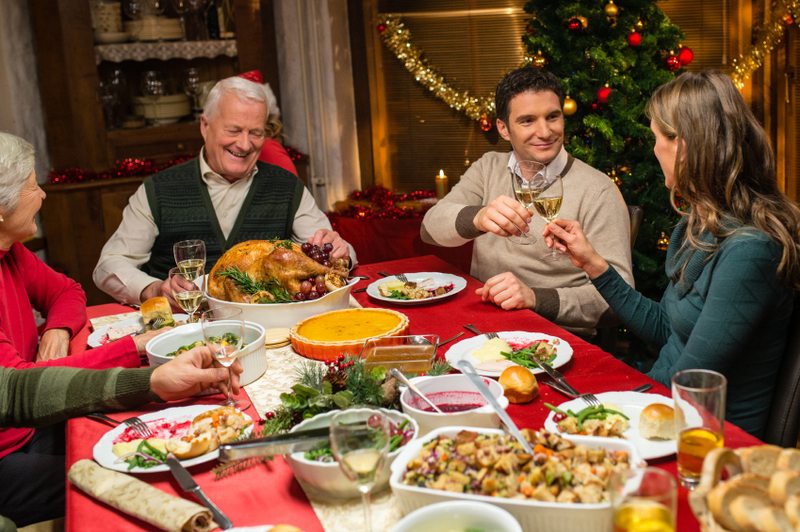 Eating a healthy, filling meal before attending your Christmas party will help you to resist the buffet table and just go for the really enticing treats. Track your turkey – Using a food tracker app, such as Noom Coach, helps you to visually see how many calories you have consumed, leading you to be more conscious with further food choices. Homemade healthy alternatives – With healthier ingredients such as cacao and buckwheat flour being more readily available nowadays, you can easily make healthier versions of much-loved Christmas goodies while bypassing the high volume of calories, sugar, fat and unnecessary guilt. Plus, making your own Christmas goodies can be much more fun! Stay hydrated – Being dehydrated can often be mistaken for being hungry, so make sure you drink a sufficient amount of water throughout the day to help keep hunger pangs at bay. Bring your own bottle – Homemade punches and cocktails will often contain a lot of alcohol and sugar, making the calorie content hard to judge. If you’re heading to a party at someone’s home, take your own bottle of low calorie alcohol like gin or vodka so you can control your intake easier. If you’re in a bar or pub, try alternating your alcoholic drinks with a glass of water to limit the amount of extra calories you drink while ensuring you stay hydrated. Opt for a smaller plate – Studies have shown that eating off a big plate encourages us to eat more. By swapping to a smaller alternative you can trick your brain into thinking you have eaten more than you actually have, allowing you to feel satisfied while consuming fewer calories. Get enough sleep – This may seem near impossible with having to fit in parties, family visits and work functions, but research has found that those who get less sleep are prone to eating more, and are more likely to reach for foods with higher fat and carb contents.